The original Tram & Bus Scrolls company. We were the first tram and bus scrolls company and to this day we still offer the very best quality of canvas, inks and timber at the lowest prices for comparable quality. We offer a flat fee of $10 for shipping, anywhere in Australia. TramScrolls.com.au specialises in replica tram and bus scrolls of various ages from 1920 to 1960, we have a large collection with destinations across all of Australia and many worldwide locations. We offer 3 standard sizes with a variety of different finishes and colour schemes. The bus scroll canvas prints are available in black & white, beige and brown or our fantastic new Pastel Blue as standard , however we also offer the choice of a more antiquated cream lettering showing the cotton fibres or for the true vintage connoisseur offer a ‘weathered’ version that is as close as we can get it to looking like an original tram destination tram banners sign. Have a look at these on the gallery page. There are also 3 different styles, the centred and underlined text (see the Fitzroy scroll to the left) and non-underlined, full -line (see the Glenelg scroll above) and also a contemporary version (see the Sydney Ferry Service scroll). 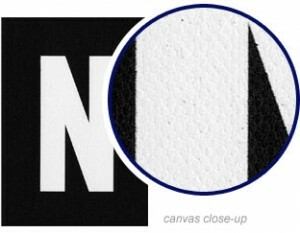 To further help keep the vintage feel we use a course 100% cotton canvas giving the canvas of the tram signs a rougher look and feel, don’t be disappointed by buying one of the lower quality poly-cotton, plasticy destination canvas rolls that are being sold. Choose from our large range of tram and bus destination blinds, then email your selection to us and we will carefully print, frame and laminate your canvas print within 5 working days or sooner. 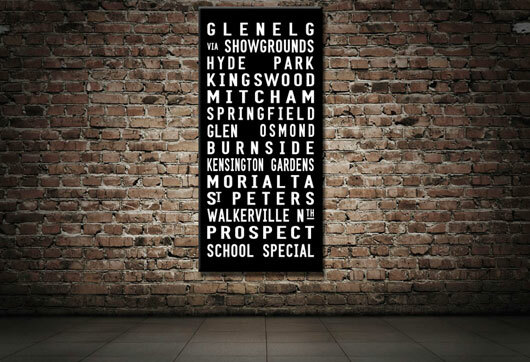 Alternatively, you can design your own tram scroll by selecting the size, colour and style you like then email us at [email protected] with the text you would like such as the towns / stops in the order you want them. We only charge an extra $30 for this service and offer unlimited proofs and revisions! 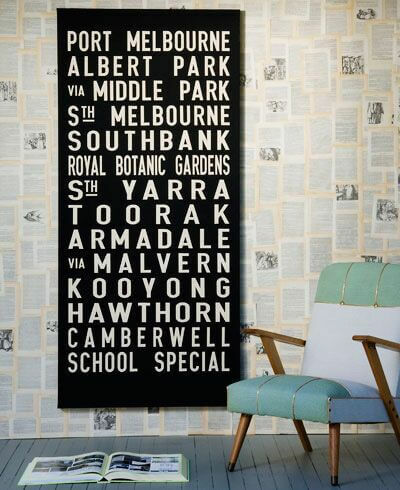 We offer a flat $10 shipping price, on all our tram scrolls and bus signs anywhere in Australia. We offer unbeatable prices and premium quality. We print using the best wide format printers in the market and always use UV resistant inks meaning that your Tram Scroll, once printed will still look good in years to come! The canvas is then stretched over a premium kiln dried wooden frame and laminated with archival artist’s invisible laminate to prevent the ink from scratching. This close up of one of our tram scrolls / train rolls shows the quality of the canvas, we use 100% cotton canvas, intentionally maintaining a rougher feel to the canvas texture to maintain the vintage feel of the scroll. 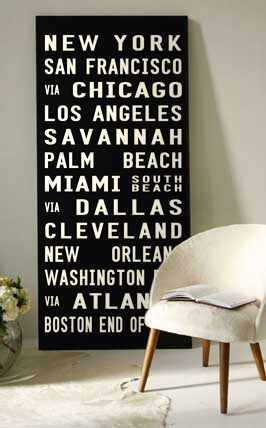 This cotton canvas helps the Destination Print to look and feel like an original vintage bus blind / scroll. Every effort is made to make sure our custom prints are striking in every way. We use a font type that looks like the originals and our canvas is kept as raw as possible. Our bus scroll collection includes a variety of font colours, in addition to the egg-shell white seen here we also offer a cream / beige font to add a weathered feel to the scroll. We offer at least 3 styles, the one seen to the left here is the original, full-line style in egg-shell white and is the most popular.